On December 30, 2008, Edgehill Cemetery sustained considerable damage when an expected thaw and rain caused the south end to collapse. I reported on it in this article. With an update here. Archaeologists were sifting through all the dirt to locate bones. At the meeting of the Town of South Bruce Peninsula on June 23, 2009, the council amended the budget to add the recovery work at Edgehill Cemetery based on the $200,000 estimate from Archaeological Research Associates Ltd. who are doing the work. I haven't heard anything recently on how the work is progressing. News Update: The Sun Times of November 26, 2009 contains an update on the status of the recovery work. Captain Edwin Dunn was born in Birmingham, England. His father was Paul Dunn. His mother's first name was Sarah. In Edwin's death registration his mother is given as ? Dugard, but his mother name is given as Sarah Giles in his marriage registration. In the 1851/2 census, the family is living in Sydenham Township with Edwin being 14 years old. Jane was the daughter of Samuel Hannah and Jane McClements. Edwin and Jane "Jennie" were married in Owen Sound on 11 January 1871. Both brothers served in the Army during World War I. They were the sons of John W. Ross of 648 8th Street East. Both of these monuments flank a Ross stone in Greenwood Cemetery, Owen Sound. His monument is the one most often used for those who served in the military. 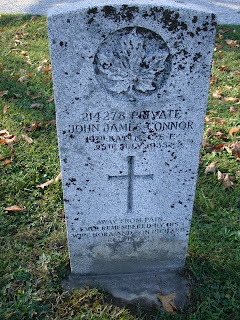 John James Connor was born 30 October 1888 in Thornton, Ontario. 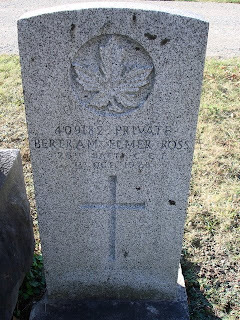 He was working as a teamster in Toronto when he enlisted in Windsor Ontario on 11 April 1916. I noticed his monument as I walked through the cemetery yesterday. The memorial plaque at Knox United Church, Owen Sound, bears the name of two brothers – Charles Haughton McKay Gordon and Thomas Seton Gordon. They were the children of Charles Gordon and Josephine Gimby. 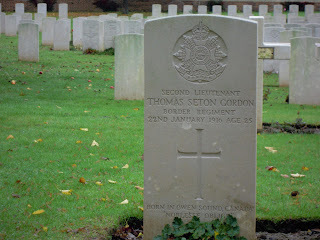 Thomas Seton Gordon is the subject of today's remembrance. Thomas was born 29 November 1890 in Owen Sound. After attending OSCI, he attended Victoria College and the University of Toronto where he earned his BA in political science. Thomas joined the University of Toronto’s Canadian Officers’ Training Corps (C.O.T.C). He attended a training camp in Quebec. On 22 May 1915, at the age of 25, Thomas joined the Canadian Overseas Expeditionary Force as a private with the 2nd University Company. He was 5 foot 11 inches with fair complexion, blue-grey eyes and dark brown hair. Thomas went to England in June where he was promoted to the rank of sergeant. While being reviewed by King George, his Majesty and the Earl of Lonsdale selected Thomas to be commissioned as a lieutenant. Upon examination, he received his command with the 11th Battalion Border Regiment. In November 1915, Thomas went to the trenches in France. He served on the Somme front in the Albert section. During the early morning of 22 January 1916, the enemy was shelling the trenches. It is reported that Thomas heard the cries of the wounded and he left the trenches to go to their aid. Tragically, he was wounded when a shell struck him. That night Thomas died. Thomas is buried at Warloy-Baillon, Grave Reference C.6. A full military memorial service was held at Knox Presbyterian Church (now United) Owen Sound to honour Thomas. His father, Thomas Gordon, town clerk, received a message of condolences from their Majesties. The church was filled for the service. The Gordon family pew was draped in purple. Photographs courtesy Charles Gordon of British Columbia. My dad, known to most by the name Bob was known during the Second World War as "Stubb". 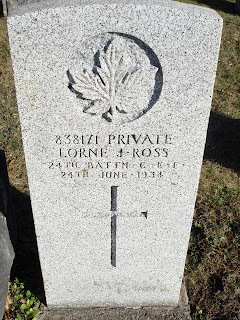 He served with the Perth Regiment based out of Stratford, Ontario. He enlisted on 29 September 1939. 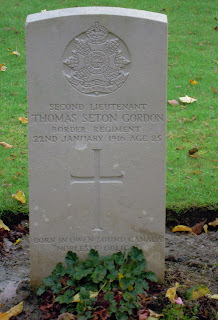 He served in Canada, England, Italy and the Netherlands. 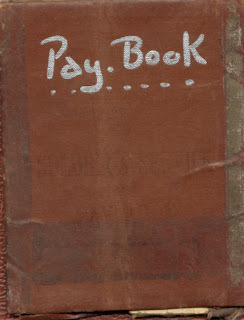 I am very fortunate to have the scrapbooks that he put together with his ensignia, pay book, certificates and photos. He worked as a cook and a butcher, but he also must have done some work in the medical corps. He also has photos in the album from different Perth Regiment Reunions. Norman Richard Birge was born 15 April 1893 in Horning Mills, Ontario to Charles and Mary Jane Birge. The family also lived for awhile in Mulmur Township, Simcoe County but they returned to live in Melancthon Township, Dufferin County. Sometime after the death of Norman’s father, Norman’s mother moved to Owen Sound. Norman was a sailor. On 24 July 1911, a border crossing record shows him entering the United States on, possibly either the Pretorian or the Siberian, both Allen Line ships, with the destination as the “Soo” [Sault Ste. Marie, Michigan]. His most recent permanent residence was in Owen Sound. His father was listed as living in Horning Mills. Norman joined the Canadian Over-seas Expeditionary Force on 7 July 1915 at the Niagara Camp. Before enlisting with the 58th Battalion, Norman had belonged to the Active Militia. Norman was 5 foot 8 inches tall with fair complexion, light blue eyes and light brown hair. Who was left to mourn his death? What is known about his family? Norman was survived by his mother, Mary Jane Birge, his grandmother, Esther Ann Beckett and his sister, Ethel Louisa Patterson and her husband John. He was predeceased by his father, and two sisters, Lena and Irene. Norman’s father was Charles Birge born 26 February 1839 in Pennsylvania, USA. Charles came to Canada about 1845. Charles was a sawmiller and a carpenter. Charles’ parents were John and Margaret Birge. At the time of his marriage, Charles was living in Melancthon Township, Ontario. On his death registration his mother’s maiden name looks like Petra. Charles Irving [?] Birge died 10 April 1912 in Horning Mills, Ontario. Norman’s mother was Mary Jane Beckett. She was born 30 December 1854 in Hamilton, Ontario to Richard Beckett and Esther Ann Knott. She married Charles Birge on 22 September 1886 in Owen Sound, Ontario. She was living in Sarawak Township at the time of her marriage to Charles. After Charles’ death, Mary Jane re-married. She married John Mitchell, a 64 year old widower and farmer from Horning Mills. The marriage took place in Owen Sound on 15 October 1913. In Norman’s obituary that was published in the Owen Sound Advertiser, Norman’s mother’s name was given as Mrs. Mitchell, whereas in the Owen Sound Sun her name was given as Mrs. M. Birge. It stated that Norman’s mother and grandmother lived together at 1576 8th Avenue East. Mary Birge died in Owen Sound on 2 April 1953 at the age of 99. Mary was buried in Greenwood Cemetery, Owen Sound. It is not known what happened to John Mitchell. Lena Maria Elizabeth was born 10 August 1887 in Horning Mills, Melancthon Township. Lena died from diphtheria on 12 February 1888. On 5 April 1889, Ethel Louisa was also born in Melancthon Township. On 3 July 1912, she married John Patterson, a candy maker in York, York County. Irene was born 13 February 1896 and died on 3 June 1896 in Horning Mills from scarlet fever. Norman’s paternal grandparents were John Birge and Margaret [Petra?]. Nothing more is known about them. Norman’s maternal grandparents were Richard Beckett and Esther Ann Knott. Both were born in England. Richard was a farmer. Richard died 27 February 1896. Esther Ann Beckett died 8 November 1921 in Owen Sound. Esther Ann Knott’s parents were James Nott [sic] and Rachel Robbins. The above is from "In Grateful Remembrance" a yet to be published work by Janet Iles. Before enlisting, William was employed as a butcher by Mr. L. M. Grant. William enlisted in Owen Sound on 15 January 1916 with the 147th Grey Owen Sound Battalion. He was 5 foot 4 ¾ inches tall, with fair complexion, blue eyes and medium hair. William trained at Niagara and Camp Borden. Who were left to mourn? What is known about his family and ancestors? William married Pearl Laura King on 25 December 1914 in Howick Township, Huron County. Laurel Pearl [Pearl Laura], born on 9 August 1896, was the daughter of Ethelbert King and Elizabeth Gilkinson. Ethelbert and Elizabeth married on 4 May 1887 in Fordwich, Howick Township, Huron County. Ethelbert was son of Stephen and Clarissa King. Mary Elizabeth Gilkinson was the daughter of William and Ann Gilkinson. William and Pearl had two daughters with the youngest being born after William left for military service. William’s father, William Flett Fraser, was born on 5 June 1868 in Orkney, Scotland. He came to Canada in 1888. In Owen Sound, he worked as a porter at the Patterson House. For forty-six years, he worked as a labourer at William Kennedy and Sons Ltd. William married Elizabeth Margaret Agnew on 21 March 1894 in Owen Sound. William died 13 May 1951. William’s mother Elizabeth Margaret Agnew was born 22 June 1873 in Owen Sound. Elizabeth died 14 May 1932 in Owen Sound. Sound (G-SEC7-13 7 & 6). on 1 July 1956 in Toronto. He is buried at Greenwood Cemetery. Unfortunately, two of William Oswald’s siblings died very young and one was stillborn on 7 September 1903. Elizabeth Margaret “Lizzie” Fraser was born 24 July 1905 in Owen Sound. She died at 15 months of age on 2 November 1906 from diarrhea and lung consumption. “Lizzie” is buried in Greenwood cemetery Sec 2- 12- 3 with the Agnews. John Allen Fraser was born 30 November 1908. He died on 9 February 1909 from gastro-intestinal indigestion. He is buried with his parents. William's parents had already experienced the loss of children and it must have so very hard for them to lose another child when William Oswald died in battle. Gladys Fraser was born 3 May 1907 in Owen Sound. She married Jack McLean. William Oswald Fraser’s paternal grandparents were William Fraser and Margaret Manson. His maternal grandparents were William Agnew and Margaret Bell. They all survived their grandson William. The above information is an excerpt from "In Grateful Remembrance" as yet unpublished research by Janet Iles. How will you remember? Comment te souviendras-tu? How will you remember? Comment te souviendras-tu? This is the theme in Canada for Veterans Week -- November 5 to 11. Here on Graveyard Rabbit of Grey, I will post a short piece on a different person each day who served our country, some of whom paid the supreme sacrifice. The Canadian Virtual War Memorial can be found here.